Blackhawks defenseman Niklas Hjalmarsson gets checked into the boards by the Minnesota Wild’s Zach Parise during action Saturday at the United Center. A 1-1-1 isn’t the most eye catching record in a week’s time. After splitting two games on their recent Florida trip and laying a huge egg against a division foe at home, the Chicago Blackhawks put up that mark and it is justified. A little less justified is the Hawks’ overall record of 6-2-3 thru 11 games — this team should be better. I’m not usually the one to panic early in the season, but the Hawks’ play started to grow on me this week… like a fungus. No one said that this title defense season was going to be easy, but so far compared to last year, the Hawks’ execution is night compared to day and their problems must be corrected. In the game at Florida Tuesday, the Hawks had a 2-0 lead in the third that got wiped out in time for overtime, they would eventually hold on in a shootout win. Against the Tampa Bay Lightning two days later the Hawks once again had a late advantage (4-3) and salted it away, this time they were overcome by their opponent in overtime. Why is this problem becoming so consistent? Because the Hawks are struggling to play a full 60 minute game with coverage breakdowns on defense, the taking of bad and numerous penalties and inconsistency on the power play being the main symptoms. Nikolai Khabibulin received only his second start of the season in Thursday’s game and didn’t look like a guy who was ready to go. Khabibulin must do better at stopping the easy shots and not turning the puck over, which leads to easy scoring chances for the opposing team. The Lightning loss is not on the second-string goalie alone, it was more an indictment of the Hawks’ overall play. In their last two games — counting Saturday’s loss to the Minnesota Wild — the Hawks have given up a total of 11 goals. This will not get it done. After giving up five power play goals in three games to start this season, it looked like the team was starting to turn the corner and play like last season. This week’s effort has been awful once again but the penalty kill unit is not entirely to blame. With various players taking dumb penalties, the PK unit has to work overtime to keep the opponent off the scoreboard. The Hawks are ranked 30th in the NHL in Penalty Kill Percentage (72.2). Players must play with more composure and under control if their play is going to improve. STAY OUT THE PENALTY BOX!….PERIOD! 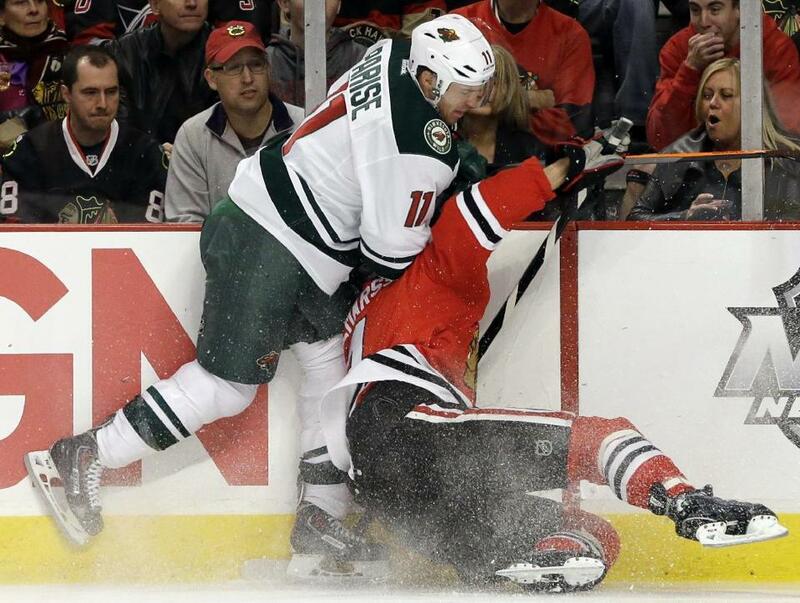 Saturday night’s effort at home against the Wild was inexcusable. I know that there’s going to be games like this throughout the season, but this was not the kind of performance to make people feel better about the Hawks’ consistently inconsistent play — instead it was just lackluster. The Wild took control of the game from the middle of the first period on, its opponent seemingly thinking that they could just show up on the ice and go through the motions and win. That was sort of the case for the Hawks’ in these two team’s first round playoff series last season, but in professional sports, it doesn’t work that way. If there’s an early season gut check to be had, the Hawks have come across it. With their next six Western Conference games coming against sub .500 teams (plus one game versus sub-.500 Ottawa from the Eastern Conference) this is the time to start correcting their problems. If not then they’ll see their schedule get truly tough in November, featuring the likes of Colorado, Nashville, San Jose, upstart Calgary and Vancouver to name a few. Any of these teams are candidates to further expose the Hawks that happening would make their problems a whole lot worse before they get better. To the entire Blackhawks organization for inviting the mothers of all of the players on their road trip to Florida this past week, another example of how this organization is first class and the number one team in Chicago. You can check out highlights of the trip on Blackhawks TV at chicagoblackhawks.com. Team Leaders: Goals — Patrick Kane (6); Assists — Niklas Hjalmarsson (6); Points — Kane (9); Penalty Minutes — Brandon Bollig (21); Goals Against Average — Corey Crawford (2.37).